S/Sgt. Lewis O. Landrum, son of Mr. and Mrs. A. Landrum, graduated from Victory High School and Cameron College; husband of the former Edith M. Gilbreth. 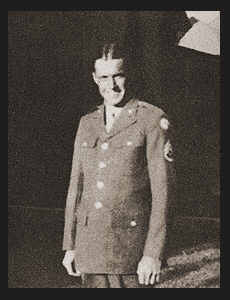 Entered Army in April, 1941, trained in Ft. Sill, Okla.; is now on duty in Ft. Bliss, Texas. Awarded Good Conduct Ribbon, Am Defense Ribbon, Victory Ribbon, Am. Theatre Ribbon.